No matter the accident, your case deserves attention. Our Monroe Personal Injury attorneys pursue justice for injury victims with compassion and tenacity. When you have been injured as a result of another’s negligent actions, justice must be served. Parker Alexander would be proud to offer you the individualized assistance, hard-hitting representation, and zealous advocacy that you require in order to maximize your compensation. 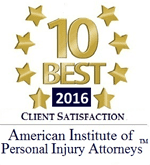 Our Monroe personal injury attorneys provide professional support to injured victims throughout Louisiana. If you or someone you know has been injured, do not hesitate to secure our assistance immediately. When you choose to retain our representation, you can rest easy knowing your case is in capable and competent hands. With our history of extensive legal experience, you can be confident in our ability to successfully handle your case. Holding ourselves to the highest standard of excellence and integrity, we are prepared to fight your fight. If you have suffered an injury and require medical treatment, we can help you obtain compensation for past and future medical treatment. Additionally, we can recover past and future lost wages. General damages such as pain, suffering, loss of enjoyment of life, inconvenience and emotional stress are also recoverable. In some cases, clients will be entitled to punitive damages (damages intendent to punish the wrongdoer when the wrongdoer’s actions were reckless or intentional). The amount of monetary compensation you are entitled to is dependent upon the unique circumstances involved in your case. Contact our attorney today to schedule a consultation. We will review your case and inform you what damages you’re entitled to recover. Do I Still Have A Claim If My Health Insurance Paid For My Medical Bills? Yes, you may still file a personal injury claim even if your health insurance provider paid for your medical bills. You are entitled to the full value of your medical treatment. Meaning, the actual cost of treatment, not just the co-pay and deductible. Insurance carriers will attempt to reduce your damages by offering to pay out of pocket expenses. Do not allow your insurance company to treat you unfairly. Let us help you ensure you recover fair and just compensation.